Hoklo has a very pristine tonal-phrase structure (連調片語) not shared by other major Chinese dialects such as Mandarin or Cantonese. Hoklo belongs to the stereotonic dialectal group of Chinese (雙調漢語方言系統), as opposed to Cantonese or Mandarin, which belong to the monotonic dialectal group (單調漢語方言系統). Hoklo's tonal-phrase structure is almost done at mathematical precision, and the essence of Tadpolenese is to provide a script that captures this crucial aspect of the language. Spelling choices for individual words are a secondary issue. The following discussion is a bit technical and is not meant for casual readers. I apologize for the briefness of this page. Because Hoklo is a stereotonic language, generally speaking, each Hoklo syllable (單字) can be pronounced with one of two tones: its running tone (動調), or its standing tone (靜調). Standing tone is used in phrase-final position, running tone is used in non-phrase-final position. A period (.) is used to mark the end of a tonal phrase. This means that, in general, the syllable immediate preceeding the period is pronounced with its standing tone. If the phrase is sentence-final (e.g: ending with semi-colon, question mark, or exclamation mark), then those sentence-final marks also automatically indicate the end of the phrase, so no additional period sign is needed. Since Tadpolenese uses period sign as phrase-final marker, we have to use a different symbol for the normal sentence ending. Semicolon is chosen because of its user-friendliness on English keyboard. Apostrophe is used whenever clarity in syllable separation is needed. Hyphen is used to mark major separation in syllables, that is, syllable separations that need a clarity beyond what an apostrophe can indicate. Hyphen is also used syllabic-finally to indicate continuation of phrase, or equivalently, usage of running tone instead of standing tone. In common Hoklo language usage, additional information (suffixes) is often appended to the phrase-final syllable. This additional information serves to qualify the last element of the original tonal phrase. This seems contradictory: if addtional syllables have been appended, then the original final syllable would not be the final syllable anymore, right? Hoklo resolves this dilemma by keeping the standing tone of the original phrase-final syllable, and then "neutralizes" the added syllables. The exact pitch value of the neutralized syllables follows some complicated rules, but in most common cases the pitch tends to be low. Daan; beuh; = a person's lastname (陳), number eight (八). There are some subtle differences between the un-neutralized 'al suffix, the neutralized `a suffix, and the neutralized suffix `aq. When used on persons or professions, the 'al suffix is a dimunitive particle used to show disrespect or disdain, whereas the `a suffix is an affective particle used to show endearment. The `aq suffix is used in general to express grief, helplessness, or completedness. E.g: hit e hourtsur'al. deh yaubal cal; = that little nurse is ranting non-stop; jit e hourtsur`a. laang jin hol; = this nurse is a very nice person, and lyl e hourtsur`aq, laang voo hol; = sigh... your nurse is not very nice. Notice that in these examples, the three suffixes are each pronounced with a different tone. 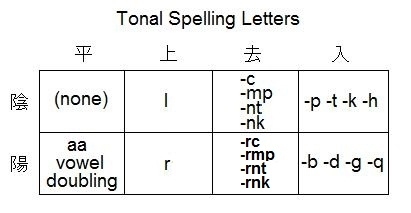 Tones are indicated by usage of specific tonal letters or letter combinations, placed after the vowel cluster. Here is the mapping table in the traditional 8-tone format. The r combination for the Yang-Shang (陽上) category may not be independent for all Hoklo dialects: in the case of Taiwanese Hoklo, this category is phonetically indistinguishable from rc (陽去). However, in Quanzhou and Teochew dialects, Yang-Shang and Yang-Qu categories are distinct. Two often-used words in Tadpolenese do not carry tonal letters: the possessive e and the negative m. This is for sake of simplicity, otherwise they would become ee and mp. Many neutralized suffixes expressing emotions are chosen to be spelt with the -q ending, like `ouq, `aq. If a syllable starts with a consonant (or can start with a fictitious constant like w- or y-), a medial -n- is placed after the initial consonant. E.g: znii = money (錢), snua = mountain (山), wnual = bowl (碗), ynii = round (圓). For glottal-stop initiated syllable (no initial consonant symbol) containing no initial u or i vowel, we use the ngh- initial. E.g: nghar = pie filling (餡). Besides its consonantal role, the phonetic ng actually also serves as a vowel in many Hoklo words. This awkward vowelless-looking spelling can be made friendlier by introducing a fictitious vowel y. Hence we have yyng = yellow (黃), synk = to calculate (算), byrng = steamed rice (飯). If a syllable initiates with phonetic u- or i-, a fictitious consonants w- or y- is prepended or used as replacement. This feature is used sparingly, to accomodate words that are pronounced differently in different dialects/sub-dialects, or to bust homonym problems. This features is used sparingly, to resolve those most common homonym cases. Hoklo is a stereotonic language and has a very unique and pristene tonal-phrase structure. Tadpolenese aims at writing out this tonal-phrase structure explicitly, and also tries to increase the readability by using interdialectal spelling and homonym buster features. Some reasons why Tadpolenese is more readable are: (1) usage of tonal letters instead of diacritics, because in a tonal language, tones actually do carry important information/correlations. For instance, in Hoklo, the Qu tone category (-c/-mp/-nt/-nk/-rc/-rmp/-rnt/-rnk) is correlated with the presence of action verbs, and the Yang-Shang tones (-r) correlated with emotional/auxiliary verbs, so larger-size tone symbols allows better visual-to-grammatical correlation, (3) presence of phrase-final mark (.) is correlated with nouns or noun-like phrases, (4) homonym busters reduce interpretation confusion, (5) interdialectal romanization helps to build in mental correlations for people already familiar with Hanyu Pinyin. Finally, because Tadpolenese uses only 26 letters, it can be typed wherever English can be typed.